Hosted by itself on its on domain as a "Help Site"
Having your FAQ on its own domain is known as a Help Site. It is a standalone site that you can link your customers to. Turning it on is as simple as going to "Settings" and then "Brands". Below your brand name will be a link to enable your Help Site. 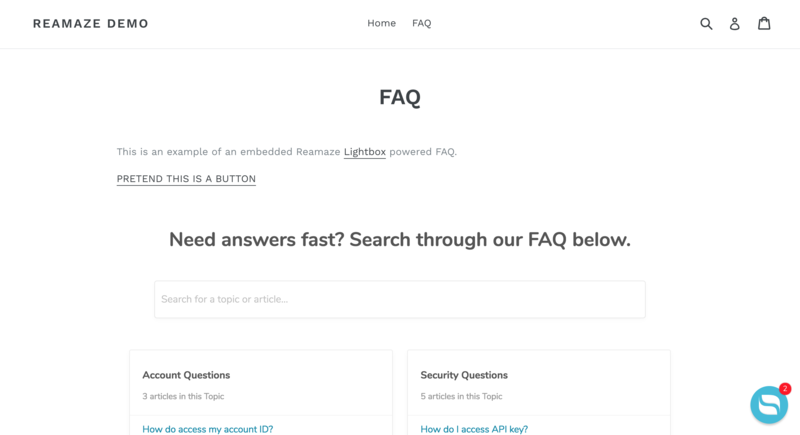 Your FAQ can also be displayed within your Re:amaze Shoutbox or Lightbox. When your FAQ is deployed in this mode, it's known as the "Self Service Mode" and gives your customers the ability to search for their own answers before they leverage the Shoutbox or Lightbox contact form/chat features to reach out to you. Loaded "as the Shoutbox" or "in the Lightbox/modal"
Loaded as "Embedded on my webpage"
You can also refer to this article for further customizations. Having a well organized FAQ can help your customers help themselves. Not all customers prefer direct communications and many are more than capable in finding solutions on their own. Your Reamaze account comes with a public Help Site ready to host your FAQ content. All you need to do is turn it on, set up your topics and articles, give it a little customization, and you're ready to go! First let's turn on your public site. Go to "Settings" and then "Brands". From there, you'll see whether or not your Help Site is active. To customize Help Site settings, click on "See All Settings". If your Help Site is currently disabled, click on "Enable Help Site" to turn it on. Help Sites that are disabled will not be able to display FAQ content. Second, let's create a topic. Go to "Articles" on the left hand navigation menu. Click on the "New Topic" or "New Article" button to start your first topic. You can add articles to each topic as you go. Remember, you can insert images and embed videos into FAQ articles by using simple markdown syntax or HTML. If you're not very familiar with markdown, you can visit https://daringfireball.net/projects/markdown/syntax#img for quick tips. For YouTube videos, simply copy and paste the embed code and paste! Third, you can sort topics and articles the way you want by clicking on the "Sort Articles and Topics" button at the top left hand corner while you're in the "Articles" view. Fourth, you can customize the header, footer, and CSS styling of your public Help Site by going to "Settings" then "Brands" then "See All Settings". Once there, you'll want to input the changes in "Custom Header and Footer" under Help Site Settings. Fifth, you can customize the base appearance of your Help Site by going to "Appearance Settings". 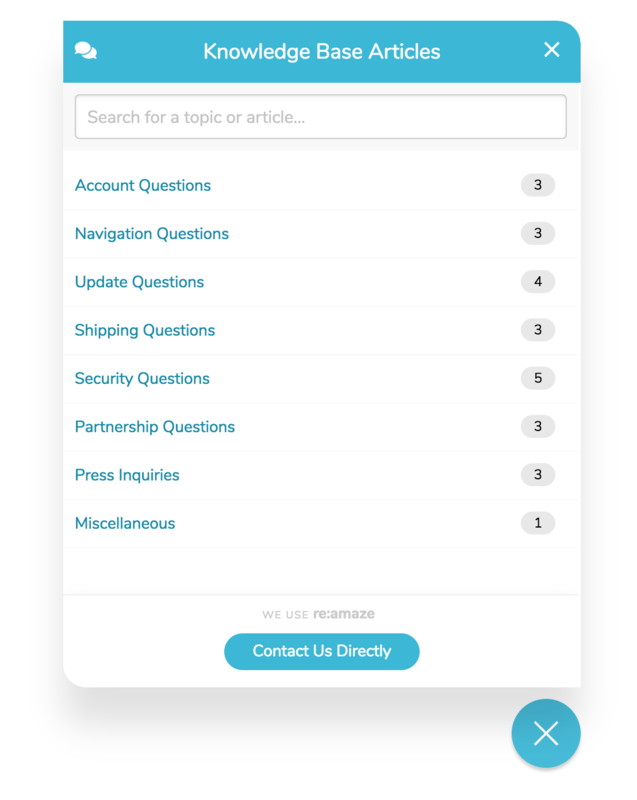 You can publish internal FAQ articles just by picking the "Internal" state. 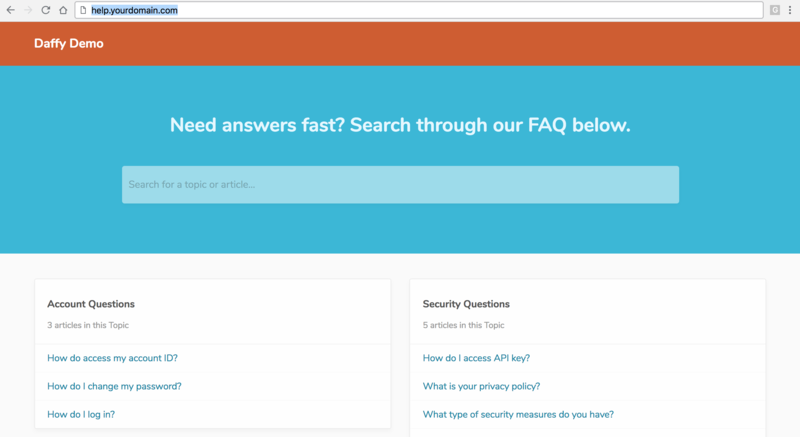 Only logged in staff members will be able to view the internal FAQ articles while on the public site. Your customers will not be able to see them. Of course, staff members can just opt to view the internal articles from within the dashboard. Internal articles cannot be inserted into replies.